I've recently gotten inquiries about my sofa. 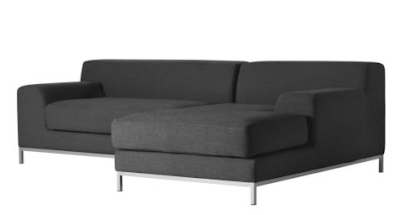 It's the IKEA Kramfor sofa in dark gray. If you are looking for an affordable mid-century-ish sofa, check it out here! 1 Response to "LOVING. LIVING. SMALL. 's SOFA"
I am LLS in South Korea, and I found the pictured set of the sofa appealing. IKEA is a bit out of the delivery zone where I live, though. You have a great blog!